A coalition of 37 human rights NGOs has sent a letter to the EU member state heads and EU leaders ahead of Azerbaijani President Ilham Aliyev’s visit to Brussels to participate in the 5th Eastern Partnership Summit on 24 November 2017. 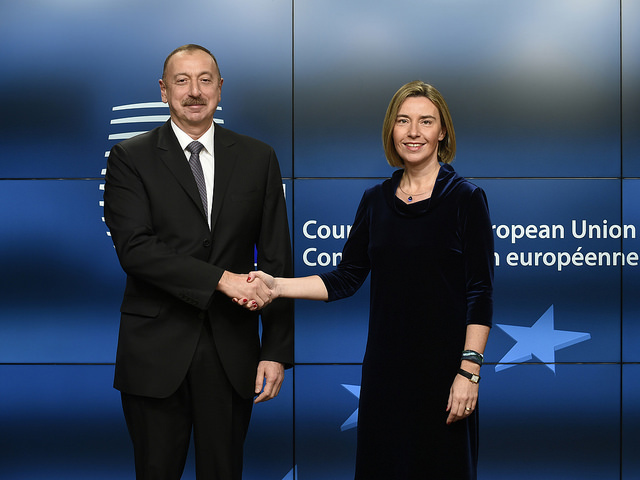 The NGOs urge the EU member state heads and leaders to use the summit to call on president Aliyev to end the current human rights crackdown in Azerbaijan and commit to concrete steps in this regard, including the release of individuals imprisoned on politically motivated charges and reforms of repressive NGO legislation. The letter was sent on 27 October to the heads and foreign ministers of the 28 EU member states, as well as to EU High Representative for Foreign Affairs and Security Policy Federica Mogherini, EU Commissioner for European Neighbourhood Policy and Enlargement Negotiations Johannes Hahn, EU Commission President Jean-Claude Juncker, European Council President Donald Tusk and European Parliament President Antonio Tajani. The letter (as addressed to Federica Mogherini) can be read below or downloaded here.